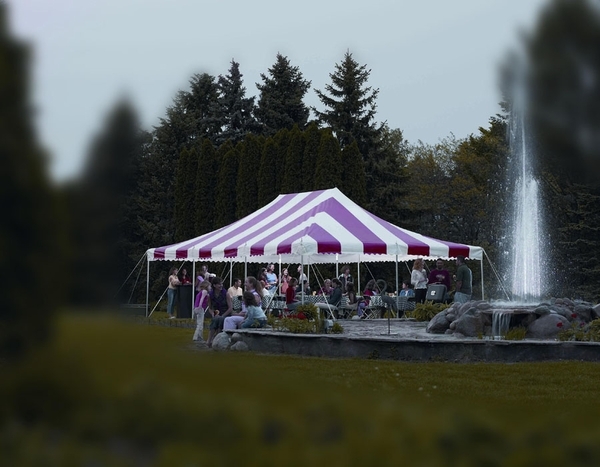 For a traditional party canopy, this Oval Eureka canopy is perfect. It features a traditional pole tent style that measures 30 feet wide by 40 feet long. The vulnerable areas are reinforced with double thickness and double stitching. The vinyl top is resistant to fire, mold and mildew. The top is one piece and is translucent to let in just enough light to make the party more enjoyable while keeping out the scorching heat and the UV rays. Does this tent have front and back panel doors and side windows? You would choose the wall you prefer on the accessories tab as a separate purchase.